Between 1940 and 1958, there was one constant for the Brooklyn Dodgers -- Pee Wee Reese at shortstop. His popularity in the hobby has been a constant just as constant. As a result, Pee Wee Reese cards and autographed memorabilia are still highly sought after. 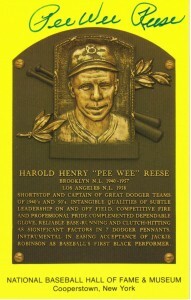 Reese was a ten-time All-Star and was part of two Worlds Series Championships. He was also instrumental in Jackie Robinson's addition to the team in 1947. 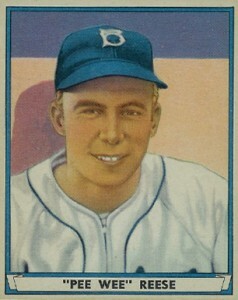 Pee Wee Reese's rookie card is from the 1941 Play Ball set. He is featured alongside Kirby Higbe in a second card in the set. Additionally, Reese has two team-issued cards, one printed in 1940 and the other in 1941. All of Reese's modern autograph cards are cut signatures. The first debuted as part of the 2000 Upper Deck Brooklyn Dodgers Master Collection. The high-end product also features some of Reese's first memorabilia cards. He has a pair of game-used bat cards, one numbered to 8 and one to 250. Reese is also paired with Jackie Robinson on a dual memorabilia card. 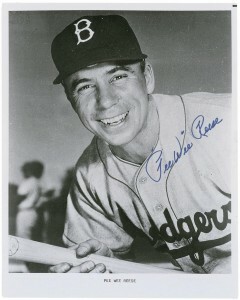 Pee Wee Reese was a fan favorite. While he does have autographed memorabilia in the market, authentic examples can often be pricey. The most commonly found items are photos, documents and other paper-type collectibles. Reese signed bats, baseballs and jerseys do exist. However, they are most often found consigned to high-end auction houses. The 1941 Play Ball set is iconic in the hobby. Reese's rookie card is one of the reasons why it is so popular. Capturing his signature smile, the card features a colorized head and shoulders image. Below you will find an example of what Pee Wee Reese's authentic signature looks like. This can be used as a first point of reference for determining the legitimacy of autograph memorabilia, but is not a substitute for having your items authenticated by a well-respected professional autograph authentication company. Some of the trusted sources within the sports memorabilia market include the following companies: PSA, JSA, Steiner, Mounted Memories and Tristar. Click on any of the images below to view full size photos. It is a very easy autograph to discern by letter. The "P" and the "R" are larger than the other letters. Both resemble a kidney bean shape. The signature is written on a horizontal plane. All of the "e"s are identical, with equal size, spacing and opening. The upstroke on the right of the "W" is longer than the other two lines. 1968 Topps Pee Wee Reese Signed Card # 168 Dodgers PSA DNA HOF Rare !